Remington S9950 Shine Therapy Moisturizing and Conditioning Digital Ceramic Hair Straightener, 1"
Remington’s Shine Therapy Hair Straightener is complete with top of the line hair technology. 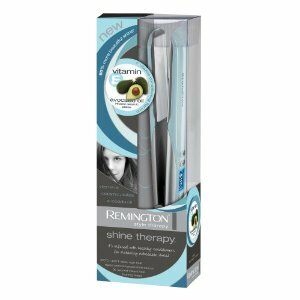 Remington has cleverly incorporate a smooth blend of heat activated, shine enhancing conditioners with avocado oil, rich in vitamin E, formulated to leave your hair looking and feeling healthy, with a brilliant shine and wonderfully straight results. The moisturisers, which are located beneath the ceramic plates, are evenly emitted onto the hair through the microscopic pores providing an ultra smooth glide and mirror shine! The vitamin infused plates have been tested and guaranteed for over 40,000 uses.